Learn how to split or half medications as a nurse. Why do we split pills? As a nurse, we may have to split a medication in order to equal the dosage ordered by the physician. For example, the physician may order 2 mg of a medication, but you’re only supplied with a 4 mg tablet. Therefore, you have to half the tablet to equal the ordered dose. Always, be very careful when splitting medications because you can give an incorrect dose. Therefore, it is always necessary to use a pill splitter (instead of using your fingertips, hands, or another object) to half medications. Not all medications can be split. If you’re unsure if a medication can be split, call pharmacy and ask them. If medication has a scored line, cut along this line to achieve the most accurate cut. 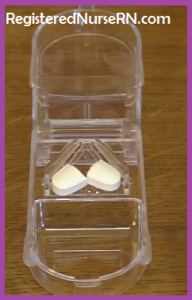 Always clean pill cutter in between medications and patients to prevent contamination. Don’t forget to waste the other half of a controlled substance. Sometimes, when you split a medication it will fall apart into small pieces and you can’t tell which part is which. Follow your hospital’s protocol for this situation. The places I’ve worked we’re required to return it to pharmacy so the patient can be credited and to start over with a new medication.